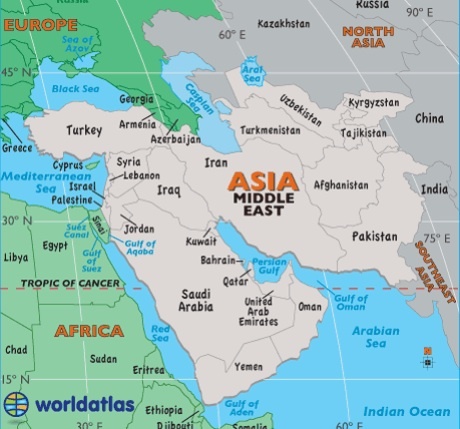 ​The Middle East area known as West Asia is located at the junction of Africa, Asia and Europe. The 21 countries of the Middle East are all technically part of Asia however they are often shown geographically as a separate landmass. Armenia and Azerbaijan have in the past been considered part of the Middle East, but in recent years, sources now consider them to be more aligned with Europe because of their their modern economic and political trends. The same situation applies to the island of Cyprus, and Georgia, the former Russian republic. The troubled images we see on television portray a scene of violence and danger in the Middle East and although this is true of some parts of the Middle East the majority of the area is booming with tourism. It is extremely important before visiting any country to check whether the country is in a stable safe situation or plan your route to avoid troubled areas. Tourism is booming in some parts of the Middle East thanks to bargain prices, new infrastructure and hotels and the focus now to entise the tourism dollar. Countries such as Dubai and more recently Abu Dhabi, are attracting record number of tourists as they offer world class accommodation and amazing sights to see. Five million tourists visited Dubai last year and they intend to tripple this over the next few years.It appears the attraction to the unlimited sunshine, luxury accommodation and bargain prices overcomes any fears that people may have with the region. The Middle East offers so much to travelers particularly interested in an adventure holiday or maybe you have exhausted all the popular holiday destinations and would like to get off the beaten track. Whether you are interested in history, religion or art you will find so much to see with lots of historic sites throughout the area. There are some great hiking tracks, diving destinations and spectacular beaches. Regardless of what you look for in a holiday destination, you will find it in the Middle East countries.